TROYES, PIERRE DE, known as the Chevalier de Troyes, officer, son of Michel de Troyes, an attorney in the Parlement of Paris, and of Madeleine Alard; d. 1688. While a captain in the Piémont regiment, he married Marie Petit de L’Estang on 5 Feb. 1681. He arrived at Quebec 1 Aug. 1685 together with Governor Brisay* de Denonville and reinforcements consisting of about 350 soldiers belonging to the colonial regular troops. He was in command of a company; he had been brevetted a captain on 5 Mar. 1685. 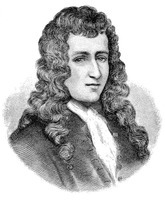 On 12 Feb. 1686 Denonville entrusted him with a difficult and perilous mission which was financed in large measure by the Compagnie du Nord: to go and oust the English from Hudson Bay and capture the interlopers (unauthorized traders), especially those in the employ of Radisson* and his group. He had under his orders a detachment of 30 soldiers and 70 militiamen. Among his officers there were three Le Moynes: Jacques, Sieur de Sainte-Hélène, the first lieutenant; Pierre*, Sieur d’Iberville, the second lieutenant; Paul*, Sieur de Maricourt, the adjutant; he had also the Jesuit Silvy*, as chaplain, and Pierre Allemand, an experienced pilot (the latter two were making this trip for the third time). The troop, divided into three sections, left Montreal on 20 March, went up the Ottawa (Outaouais) River, and utilizing the lakes and rivers, reached Hudson Bay on 20 June. They seized Fort Monsipi (Moose Factory or Saint-Louis), Fort Rupert (Charles Fort), and Fort Quichicouanne (Fort Albany). 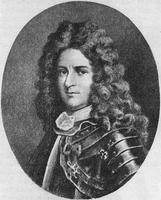 The Chevalier de Troyes was back in Quebec at the beginning of October 1686, leaving Pierre Le Moyne d’Iberville in command of the captured forts. 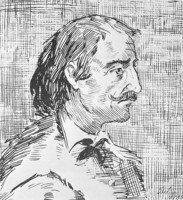 During the winter Governor Denonville was preparing his too famous attack against the Senecas. The Chevalier de Troyes was in command of one of the four companies of the expedition, which set out on 17 June 1687. By force and ruse Denonville succeeded in capturing about 200 Iroquois. He released most of them, but kept some of them, whom he sent to serve in the king’s galleys. He next went to devastate the Seneca villages on the south shore of Lake Ontario, then proceeded to Niagara to rebuild the fort that Cavelier de La Salle had previously constructed. On 31 July, when the work was finished, he left a garrison of 100 men there under the orders of the Chevalier de Troyes. The winter of 1687 was particularly distressing for the garrison, which was subjected to the avenging forays of the Iroquois. In addition scurvy wrought havoc among the troops, who attempted to revolt. There remained only a handful of men capable of resistance. The Chevalier de Troyes was himself struck down by this malady, and he succumbed to it on 8 May 1688. In the three years he spent in Canada the Chevalier de Troyes had been in command of an important expedition and had taken part in another. He had acquired the confidence of the governor, who had entrusted to him the defence of a strategic post. Denonville considered that he was “the most intelligent and the most capable of our commanders,” and that he possessed excellent qualities as a leader, that he was “wise and sensible and full of good will.” Death put an end too soon to a career that gave promise of being a brilliant one. AN, Col., C11A, 8, 9. Charlevoix, Histoire, I. Jean-Baptiste de La Croix de Chevrières de Saint-Vallier, Estat présent de l’Église et de la colonie française dans la Nouvelle-France . . . , réimprimé . . . d’après l’édition de Robert Pepie, Paris, 1688 (Québec, 1857), 43–45. La Pot(h)erie, Histoire, I, 147f. NYCD (O’Callaghan and Fernow), III, 396; IX, 307, 335, 339f., 351, 359, 396. Chevalier de Troyes, Journal (Caron). L. J. Boucher, “Une Abitibi traîtresse au XVIIe siècle,” RHAF, XIII (1959–60), 93–96. Crouse, Lemoyne d’Iberville. Frégault, Iberville, 89–106, et passim. HBRS, XXI (Rich). Robert Le Blant, Histoire de la Nouvelle-France: les sources narratives du début du XVIIIe siècle et le Recueil de Gédéon de Catalogne (1v. paru, Dax, s.d. ), I, 176, n. 37, 196. P.-G. Roy, “Le chevalier de Troye,” BRH, X (1904), 284–87; “Les commandants du Fort Niagara: Pierre, chevalier de Troye,” ibid., LIV (1948), 131–33. Léopold Lamontagne, “TROYES, PIERRE DE, Chevalier de Troyes,” in Dictionary of Canadian Biography, vol. 1, University of Toronto/Université Laval, 2003–, accessed April 19, 2019, http://www.biographi.ca/en/bio/troyes_pierre_de_1E.html.